Is it just me, or is everyone feeling that we are in the worst of the Dog Days of Summer? In Ontario we have had some very hot and humid days, and some wicked storms that have knocked down a lot of trees, but that’s not the worst of it. The worst of it is that the biggest news of the last week is that someone had a baby in a hospital, and then a day later went home. I realize that the baby is the future king, but really, this is big news? I guess it is; we all had fun pondering it on the royalty thread on the Buy High Sell Higher Forum, but I suspect it was because we had nothing much else to discuss. Of course there was other news. Some guy named Weiner who is best known for sending pictures via text of his, well you know, wants to be mayor of New York City. I realize that psychopaths tend to gravitate to positions of power, but under what circumstances would anyone actually vote for a guy who literally can’t keep it in his pants, and promises that he has stopped, but keeps doing it, and keeps lying about it? And yet he is still doing relatively well in the aptly named polls…..
Of course New Yorkers love this sort of thing, as apparently Eliot Spitzer is also leading in the polls for whatever it is that he is running for. Then we’ve got the Governor of New Jersey, who wants to be President, picking a fight with Rand Paul, who wants to be President, who is worried that Republicans are drifting toward a more libertarian view of foreign policy. I may be missing something, but isn’t that a good thing? The U.S. will spend $692 billion on military expenditures this year, considerably more than China ($166 billion) or Russia ($91 billion), the next two largest spenders. That seems like a lot of money to me, somewhere around $2,200 for every human in the U.S.A. Can the U.S. really afford that? I suspect not, so perhaps a more libertarian approach to foreign policy would make sense. I am not an American, and I am not a supporter of any politician, American or otherwise, and I realize many of you get upset when I start mentioning politics in this space, so please do not mis-construe my comments. I am not saying Paul is good and Christie is bad. They are both politicians. I am also not criticizing Americans. I was born in Toronto, and the Mayor of Toronto is a big doofus, so we Canadians cannot claim any superiority in the politicians we choose to lead us. I am merely making the point that this is truly the Dog Days of Summer, as we have nothing better to talk about than the drivel that passes for news these days. We aren’t talking about the economy, or government spending, or personal freedoms, or education, or anything of lasting importance, but I guess that’s why these are the dog days of summer. 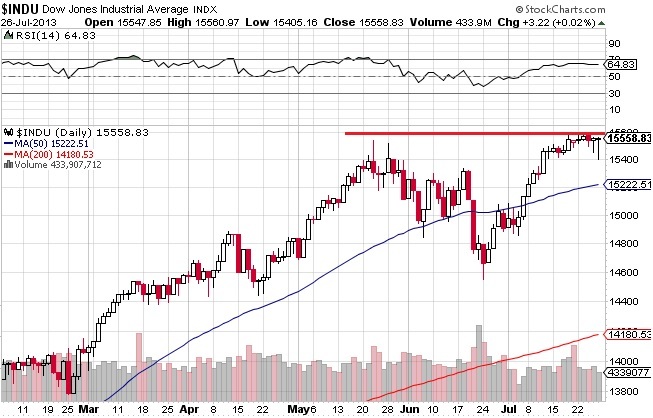 On the markets, the Dow may or may not be reaching an intermediate peak. 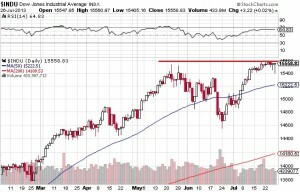 The 15,600 level appears to be offering some resistance at the moment, as the Dow stayed stuck in a trading range this week. The RSI is also stuck in the 65 range, which is close to over bought territory. I’m the guy who predicted the Dow would be around the 12,000 level at this point in time, so clearly I have no understanding of how the markets work. Perhaps it’s just the Dog Days of Summer, and there are no forces moving the market, so the market isn’t moving. As for gold, the picture is somewhat more revealing. 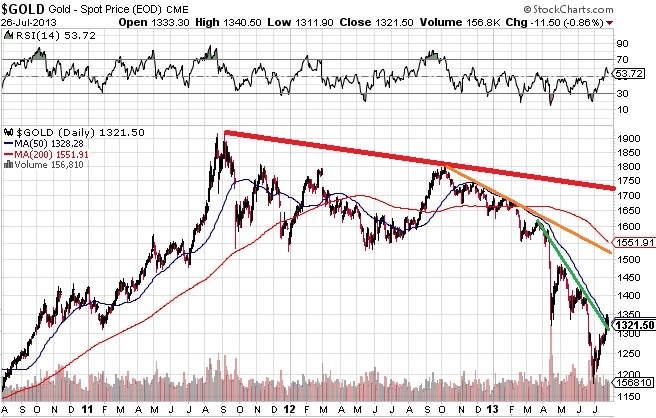 The downtrend from the peak two summers ago is obviously still in place, but it is possible that the $1,200 level is a solid bottom. Personally, I will believe it when I see it, so I’m not doing any new buying at this time. If I had to guess, I would say that a full capitulation has not yet occurred, and I will feel much better about new buying if an when we have another test of the $1,200 level. If that holds, we should be good to go. If the Big Boys want to test $1,000, then that’s what will happen, and then that’s when the buying will start. I’m not selling, I’m just not doing any new buying at the moment. And that, my friends, is my report on the Dog Days of Summer for this week. Thanks for reading. See you next week.